I will preface this trail description by explaining that while Christmas Valley is a “downhill” singletrack – and a technical one at that – the first stint of it involves a seriously graded climb, and the downhill payoff is littered with so many rocks that one’s descending momentum is significantly dampened. Expect to power pedal throughout the entirety of this gradual downhill, weighting and un-weighting your front tire, as you precariously steer from side to side through uneven rock section after relentless, rutted rock section. It’s as if you were engaged in an enthralling game of bumper-bikes with a rock-splattered Jackson Pollock painting. 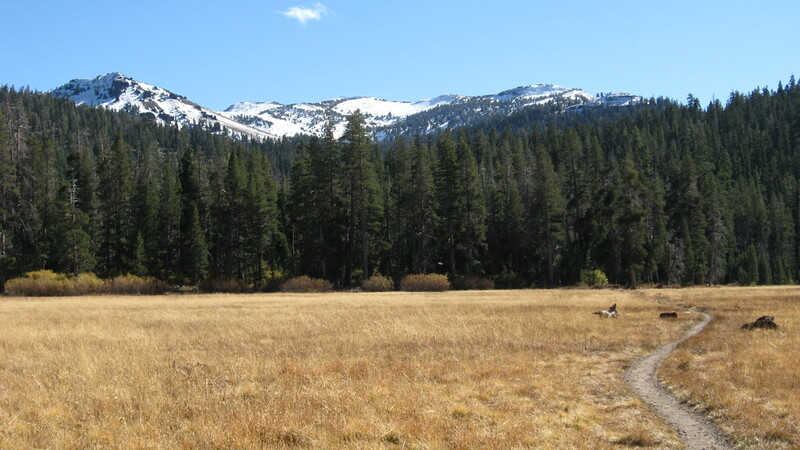 From South Lake Tahoe, head south on Highway 50 to South Upper Truckee Road and turn left. Drive for about four miles and park at the south end beyond the bridge crossing over the Upper Truckee River, just before the switchbacks. 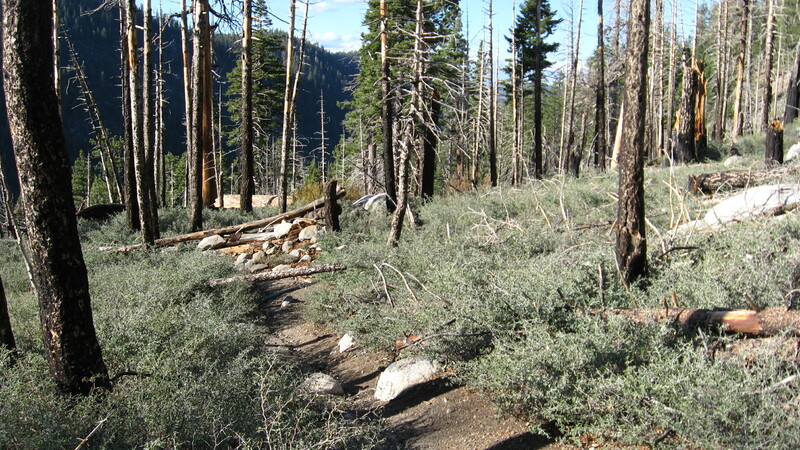 Note Hawley Grade downhill lets out before the bridge on the right and Christmas Valley downhill leaks out shortly after the bridge on the same side. 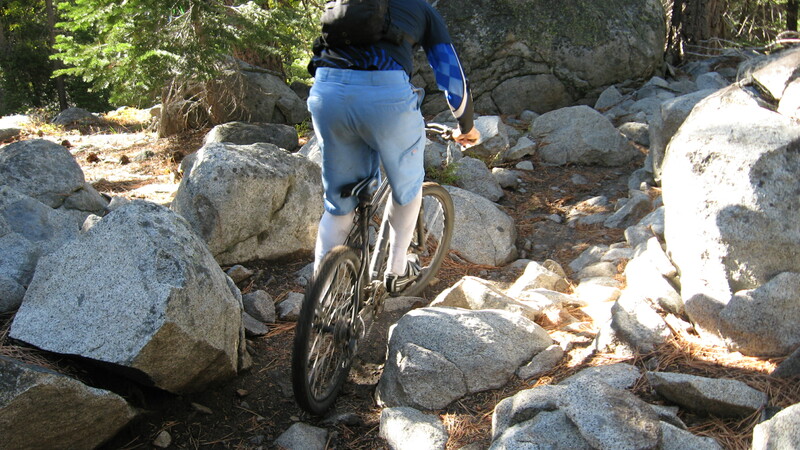 Either bike or drive a shuttle car up the twists and turns of South Upper Truckee pavement, crossing comely, creek-like falls at two points along the way. Traverse Highway 89 and continue on a buckling strip of asphalt up to Big Meadow Campground parking lot on the right. The Tahoe Rim Trailhead is located on the south end of the parking area. 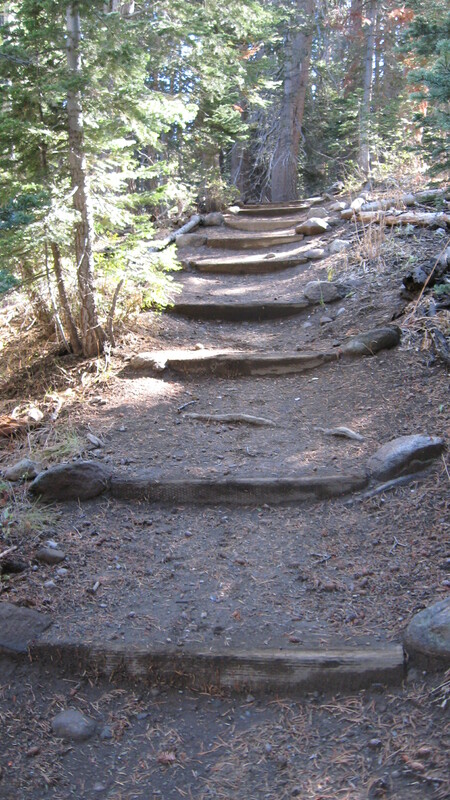 At 0.2 miles, the trail crosses Highway 89 and continues en route to Round Lake. In lieu of trekking up more one-lane switchbacks, one can alternatively turn right onto Highway 89 from South Upper Truckee Road. 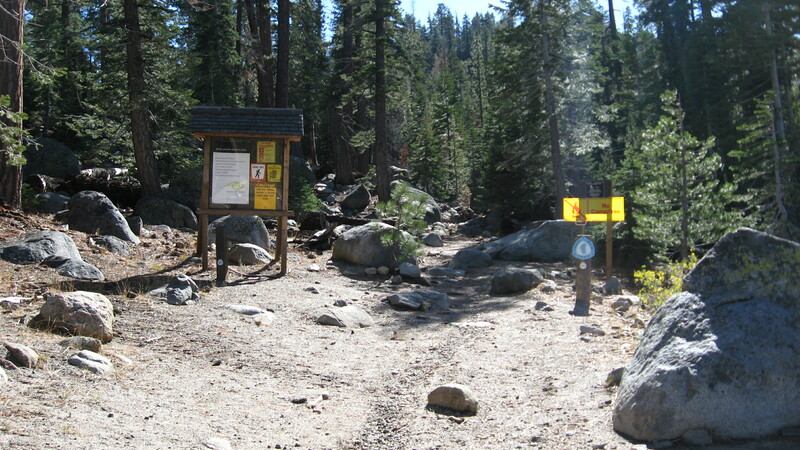 With this option, enjoy a gradual straight-shot climb to the Tahoe Rim Trailhead, located about one mile up on the right, just before the yellow, “Share The Road” traffic sign. 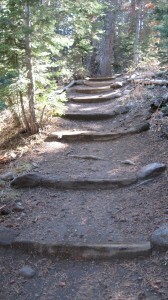 Following a rocky start, maneuvering up and over slick boulders, the eventual dirt trail clings to a pine and aspen border. 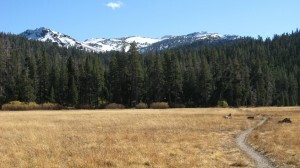 Plateau at a clearing for one astounding view of a rustic country path through flaxen Big Meadow, complete with deep-green forest trim and saintly, snowy Carson Range peaks in the distance. After puttering through this quaint, flat, reprieve of a meadow, plunge back into pine for the most punishing leg of the climb. Pop your wheel up a couple of steep, earthy, wood-plank staircases, along with a few twiggy, wall-like spurts, and before you know it, you’re at the ridgeline, gazing at Little Round Top Peak from afar. Next, quiver down switch-backing, loose dirt on a tousled hillside, linking zigzag corners with elongated straight-aways. The last zigzag turn comes at a crossroads. 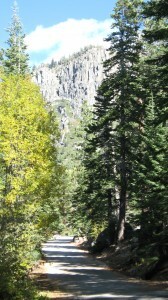 A wooden post assigns Round Lake trail to the left and the desired sharp right turn onto Christmas Valley downhill. Pedal hard to milk every bit of speed on this needle-matted, initial part of Christmas Valley, which fringes a lively tributary of the Upper Truckee River. Thereafter, embark on a tortuous singletrack obstacle course of wobbly, jagged, tightly-knit granite. Fortunately, these rugged sections, with rocks ranging from one inch to twelve inches in stature, are interspersed with soft, loamy interludes. Dardanelles then dips into a bleak, fire-tormented area of coal-colored, brittle silhouettes, still a pine tree at their core. In August 2002, a two-person plane crashed at Elbert Lake and fierce fall winds spread the fire across nearby mountainside to this modern-day burn area, which sits on Christmas Valley’s sinuous curves. 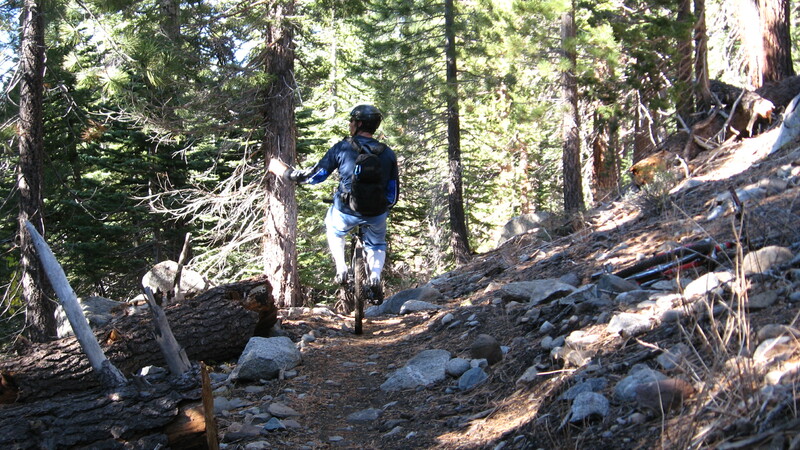 After casting away the shadows of charred timber and ash, tackle familiar, gritty territory, characteristic of Christmas Valley downhill, all the way to the singletrack’s outlet onto South Upper Truckee Road. Loved your comment about “bumper bikes”. I can remember playing that game when I was a kid. It usually resulted in 2 cracked heads. Great article. Nice to see you are using your own photos now. Great Job!